This gluten free, vegan lasagne is a fantastic alternative to the meaty, diary laden versions. It’s tasty, filling and full of healthy protein and nutritional goodness. In this version I use twirly rice fusilli pasta instead of flat lasagne pasta sheets. You can, of course, buy pasta sheets and use them instead. Gluten free pasta sheets are more specialist and expensive (here in the UK at least), so I prefer to use fusilli. Any good health food store should have gluten free pasta – use whatever you can find. I felt quite excited at having a creamy ‘cheese’ type sauce on top too and opted for cashew sauce, which, with it’s rich creaminess, works lovely as a dairy-free sauce alternative. After baking in the oven for 40 minutes it gives a pleasant rich crispy ‘can’t-quite-guess-what-it-is-but-I-like-it‘ effect. This dish works for gluten-free vegans and regular eaters alike. We enjoy this with a hearty green salad. The cashew sauce is made by first soaking the cashews for up to an hour to make them soft enough to blend. Place the cashews into a mug or jug along with the juiced lemon, salt, pepper and parsley. Allow the cashews to soak in the lemon juice for up to an hour and then blend with a blender to create a thick creamy sauce. If the sauce is too thick then add a dash of water to achieve your desired sauce like consistency. Roughly chop red onion and mushrooms. Crush or finely chop garlic and saute in a medium sized pan with onion and mushrooms (with a splash of olive oil) for a couple of minutes to bring out their flavour. Add the lentils and water to the pan and bring to the boil. In the meantime add allspice, cinnamon, cardamon, sea salt, coconut sugar and passata to the pan, stirring to mix everything together. Whilst the lentil part is cooking in the pan, cook the pasta, drain it and put to the side. Slice apple into thin slices and roughly chop parsley. When the lentil part has cooked, add the parsley to the pan and mix in. Spoon about half of this lentil mixture into an oven proof dish and add a layer of your cooked rice pasta (this should be about ½ of your pasta). 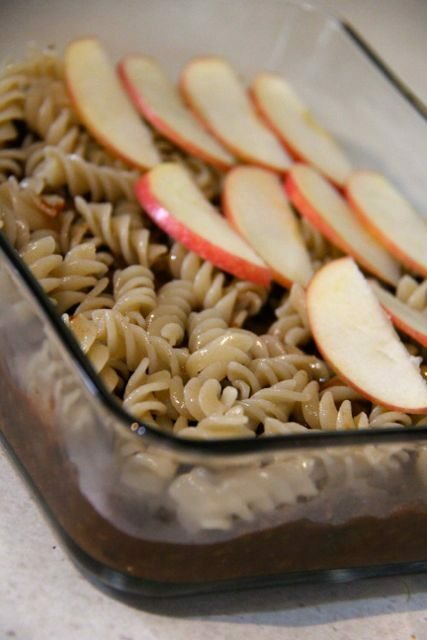 Make up another layer on top of the pasta with your apple slices. Spoon the rest of your lentil mixture on top of your apple layer and then add another layer with the rest of the pasta. Spoon/pour on your cashew sauce on top of the final layer of pasta. If the cashew sauce seems too thick, then add a little water to loosen it up. But remember there is no right or wrong. If you creativity is inspired, then let it flow! Place your whole dish in the oven at gas mark 6 (200˚C/400˚F) for approximately 40 minutes and then serve hot with veggies or salad.